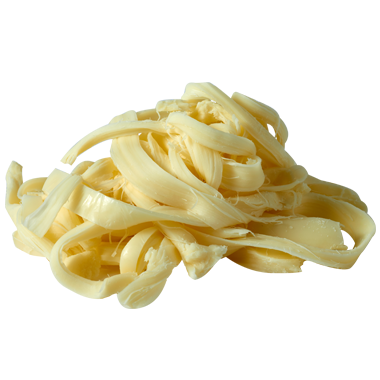 Named for the southern Mexican state of Oaxaca from where it hails, high-moisture Oaxaca cheese employs the same string cheese process as mozzarella. This makes perfect sense, because it was brought to Mexico by Italy’s Dominican monks. If you’ve never had a quesadilla with this gorgeously melty cheese, then we urge you to warm up your skillet and grab the tortillas. We love it and so do kids. Their favorite part is that it pulls apart and ribbons just like their beloved string cheese. Added bonus: it’s delicious and has a well-travelled tale to tell. Stretched-curd Oaxaca cheese is made to be melted and it never disappoints when it comes to quesadillas, empanadas, stuffed squash blossoms and other melty deliciousness. You can certainly eat it right out of the fridge, but we think it’s best soft and melted. Since Oaxaca cheese is so mild it goes well with less assertive drinks. We recommend champagne, pinot gris and sauvignon blanc. Beers that work well: pilsner, American pale lager and wheat ale. If you want liquor, light rum is a tasty partner. Our favorite thing about Oaxaca cheese is its ultra-meltability. It’s our go-to for quick-and-easy quesadillas, of course, but we also love it melted into a hot queso dip mixed with a zippy salsa verde, on pizza, in chiles relleños and in taste-the-garden, veggie-loaded scrambles.